"These towels come in a variety of sizes and colors, and reviewers love how high-quality they are for an affordable price." "Made from 100 percent cotton...The crisp white color will match just about any decor, and the towels have a soft texture and absorbent quality." "Soft, durable, and absorbent. Plus, they're made with fade-resistant colors so they'll maintain their vibrant hue even after numerous washings." "Made with a super soft and absorbent Egyptian cotton...available in eight beautiful colors, including white, moss green, ice gray, and serenity blue." "Made with special 'air rich technology' that uses a mixture of PVA and cotton fibers...This ensures the towels are ultra soft, thick, and absorbent." "Come in a beautiful floral print that mixes blue, pink, and green flowers on a white background." "Embroidered with a sweet design that features a raccoon and other woodland creatures." "Twist your hair up into the towel then secure it with the elastic, and it will stay in place until you're ready to style it." For the best of both worlds—quality and affordability—seek out the Better Homes and Gardens Thick and Plush Solid Bath Collection at Walmart. These towels come in a variety of sizes and colors, and reviewers love how high-quality they are for an affordable price. What's great about this collection is you can buy pieces individually—they offer bath towels, hand towels, washcloths, and bath sheets—or you can buy a six-piece set. There are dozens of trendy colors available to match any decor, and the 100% cotton towels are extra absorbent, too. Reviewers love that these towels are thick and plush, yet still affordable. Several note that the towels stay incredibly soft even after you wash them, and the colors stay vibrant as well. If you're looking to stock your bathroom with towels but don't want to spend a lot of money, you'll love Mainstays Performance Bath Towel. This product only comes in one size and color, but they're great quality and you just can't beat the price! This bath towel is made from 100% cotton, and it measures 27” by 52”. The crisp white color will match just about any decor, and the towels have a soft texture and absorbent quality. Reviewers love how soft and durable these towels are, noting that they will quickly become a bathroom staple. If you're looking to replace your existing towels with new ones, Mainstays Textured Performance Towel set is a great option. Not only are these towels affordable, but they receive top marks from reviewers thanks to their superior performance. Each set includes two bath towels, two hand towels, and two washcloths—the bath towels measure 30” by 54", the hand towels are 16” by 26", and the washcloths are 12” by 12”. You can choose from a variety of basic colors including white, brown, blue, and red. The towels are made from 100% cotton, so they're soft, durable, and absorbent. Plus, they're made with fade-resistant colors so they'll maintain their vibrant hue even after numerous washings. According to reviewers, this towel set is on par with luxury brands. 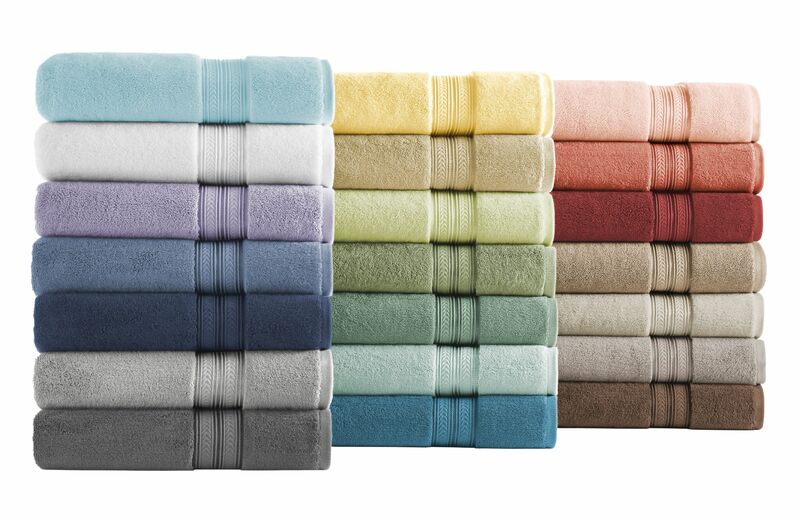 Many reviewers commented that these towels are incredibly soft and fluffy, and they only get better with time. Standard bath towels measure around 27” by 52”, but some people prefer oversized towels that they can really wrap themselves up in. 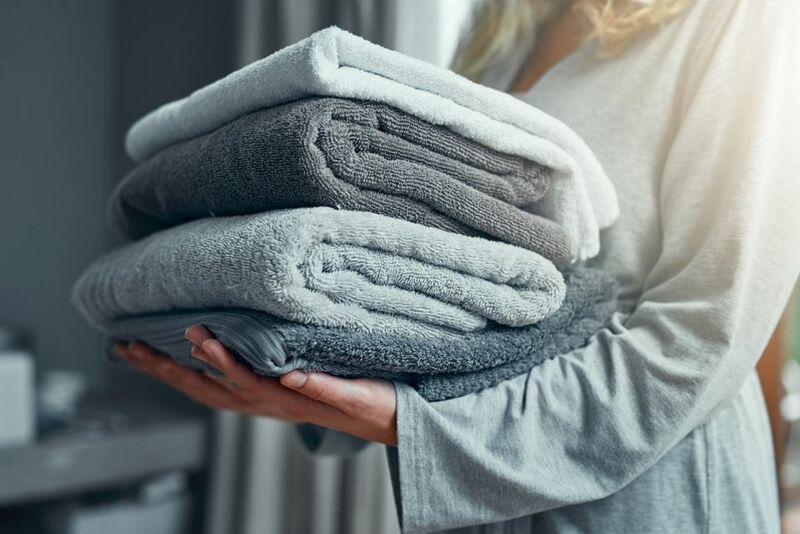 If you're on the hunt for the perfect oversized towel, consider the Egyptian Majestic Egyptian Cotton Collection from Walmart. These towels come in sets of six, including two oversized towels, two hand towels, and two washcloths. The bath towels measure 30” by 56” and are made with a super soft and absorbent Egyptian cotton. This set is available in eight beautiful colors, including white, moss green, ice gray, and serenity blue. These towels receive rave reviews from customers, who say the product is soft, plush, and luxurious. If you're looking for an oversized towel that won't break the bank, the Egyptian Majestic Egyptian Cotton Collection is the way to go. If you're looking to upgrade the hand towels in your bathroom, Member's Mark Hotel Premier Collection 100% Cotton Luxury Hand Towel is a great option. This hand towel has earned rave reviews thanks to its soft, plush texture. This hand towel is made with special “air rich technology” that uses a mixture of PVA and cotton fibers to create small air pockets in the yarn. This ensures the towels are ultra soft, thick, and absorbent. Plus, the towels have low linting properties and will stay vibrant in color. Reviewers love that these towels are amazingly soft and durable, but still absorb water quickly. They're slightly more expensive than other options at Walmart (and they're only available in one color), but the quality is unbeatable. If you're looking for a vibrant, patterned towel to spice up your bathroom, you should consider the Better Homes and Gardens Tranquil Floral towels, which come in both bath towel and hand towel sizes. These lovely towels come in a beautiful floral print that mixes blue, pink, and green flowers on a white background. They're made of 100% cotton, so you can rest assured they’re as soft and absorbent as they are pretty. The bath towel measures 27” by 52” and the hand towel is 16” by 28”—bear in mind that the two are sold separately. Reviewers say that the Better Homes and Gardens Tranquil Floral towels have a beautiful design and are very soft. However, some reviewers noted that they're a bit thin for daily use, so they might work better as decorative accents. On the hunt for cute, functional towels for your children? Look no further than the Mainstays™ Kids Woodland Creatures Bath Towel. These adorable teal towels are embroidered with a sweet design that features a raccoon and other woodland creatures. They're made from 100% cotton and measure 25” x 50”, so they'll easily wrap around your little ones. Not to mention, they're extra absorbent to help kids dry off quickly after a shower or bath. According to reviewers, these towels are simply darling, and the color is much prettier in person. While most people purchased these towels for their children, several reviewers said they bought the towels for themselves because they're so cute and high-quality. If you have long hair, you know the struggle of trying to wrap your locks up in a towel after you get out of the shower. Normal towels usually just fall out, leaving you with wet hair all over your shoulders. The easy solution is to purchase a specially-designed hair towel like the Turbie Twist. This microfiber towel makes it more convenient to dry your hair thanks to its tapered design and elastic loop. All you have to do is twist your hair up into the towel then secure it with the elastic, and it will stay in place until you're ready to style it. It's so much easier than struggling with a normal towel! Reviewers can't say enough positive things about the Turbie Twist, writing that it stays in place and dries hair much better than a standard towel. Plus, many say it's durable and will last for several years, so it is a worthwhile investment for those with long hair.